let me preface this with the fact that I 100% believe that every woman should be able to birth where she feels the safest and most comfortable! I came across this article today and I thought I would share it with you as you navigate through all the info and options as you decide on the best place for you (or your partner, or sister, or friend) to give birth. It is written by a medical doctor who had 4 home births before she went to medical school and walks you through whether post medical school she would still choose to do the same. I think regardless of where we give birth though, the more we can avoid the unnesseccery interventions, the better off we (and our baby) will be. "Home Birth is More Than a Romantic Choice: It’s About Mom’s and Baby’s Health and Safety where we choose to have our babies actually has to do with more than simply personal preference, spiritual beliefs, and romantic notions. It’s a public health and safety issue. Just skimming the surface, we know that planned home births lead to substantially fewer unnecessary cesarean sections than do hospital births. We also know that prenatal care and birth attendance provided by a midwife are more likely to help pregnancy and birth stay on a natural trajectory, and are much less likely to result in unnecessary interventions of any type." *one of the most important reasons I became a doula was to help mama's avoid these interventions no matter where they choose to birth! 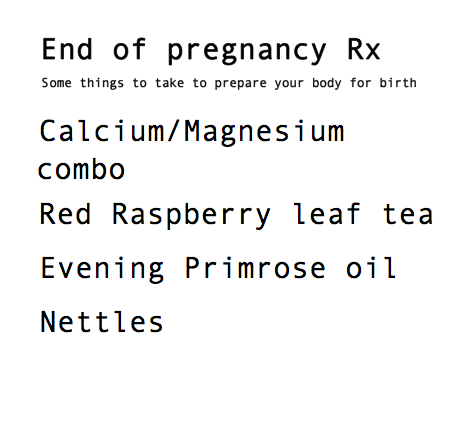 There are a few things I took at the end of my pregnancies that I feel contributed to preparing my body to give birth. Though there is no magic pill that will ensure you have a quick efficient labor and birth, it can never hurt to set your body up for success by treating it the right way. red raspberry leaf tea- drink up mama! this helps tone the muscles of the uterus and can allow it to work more efficient by encouraging the uterus to let go and function without tension. Drinking nettles ( I actually had someone pick me real nettles and steeped them!) High in essential vitamins, Nettles can help enrich the breast milk, reduce hemorrhoids, prevent postpartum hemorrhage, and help ease the pain during and after birth. this is a very short list of all the amazing benefits these things provide. Do your own research as well and then if it sounds beneficial to you, give these labor helping supplements a try! Also, don't forget to eat a balanced diet of whole foods to give your body the important nutrients it and your growing baby needs! I could see see a million babies be born and I can promise you, it would never ever get old! When I say this baby was born "on the hill" I am referring to OHSU here in Portland. If you are wanting a hospital birth that is progressive and going to respect your desires, OHSU is a good place to start. It's very much still a hospital, but if that brings you the peace you need, I would say it is definitely one of the first hospitals to check out! I have attended quite a few births up there now and am filing away the providers names I have so enjoyed! Anyone out there have their own recommendations of providers they have encountered in the Portland area they would love to share? Ones that have a strong respect for the natural labor process and give the space needed to freely birth? Like I said, I have a ongoing list but I love hearing mamas personal experiences and I know I am nowhere near having met them all! Feel free to share here or message me directly at the envelope on the top of the page! hoping your day was close to being as fun as mine! I have always enjoyed relaxing in a hot bath at the end of a long day. So being able to do something so comforting and familiar when in labor was such a wonderful treat. I cannot tell you how much water played a positive role in the labor and birth of both my girls. Both times when my contractions got strong, the water relaxed me, took the edge off, and allowed me to get myself in the positions I needed to be in to bring sweet relief. Pretty much anywhere you birth in Portland is going to allow you to labor in water at the least; And more and more birthing in water is becoming readily available if the mother so desires. If you want the option to labor and birth in water and are choosing a hospital birth, make sure you look into seeing if this is something your hospital provides (I know currently OHSU and Emmanuel do and typically you will need to set this up and take a class ahead of time.) Having it as an option when the time comes is really great because you just never know if it'll be just what your laboring body may need! I had both my girls at home, so it is no surprise that I am comfortable with home birth. This study was just published on the Huffington Post. I thought the article was pretty good and I love any positive exposure home birth gets! I think a very important piece of home birth that is not touched on here though is the fact that a lot of complications that are directly related to the interventions commonly used in a hospital can actually be avoided by staying home. Regardless of where you want to have your baby, the less we intervene and allow your body to go through it's natural process, the better off you will be!